My name is Kim Wilkerson. Our animal family members always bring us so much joy. I have worked in the veterinary field for over 15 years and now work part time teaching at my children’s school. 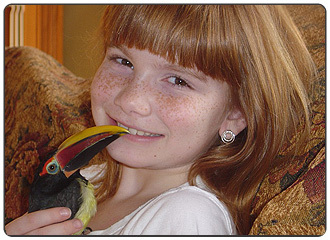 We decided to adopt a Toucan ( a male Green Aracaris) from Jerry Jennings at Emerald Forest Bird Gardens. When our bird arrived, the first thing I saw was a beautiful colorful beak poking through the carrier door. The name Pokey seemed perfect. Right from the start Pokey loved to be cuddled and petted. We set up his aviary in our kitchen family room area where he is with us all the time. Though the dogs bark and the kids yell, Pokey is so happy and content to be a part of it all. He purrs all the time especially when we hold him. He loves to put his tail up and fall asleep on me at night before we all get ready to go to bed. He lets anyone hold him and really enjoys socializing when we have company. It is so entertaining to watch him play with his toys or toss a piece of fruit in the air and go diving after it. Pokey has been a great addition to our family. He has the sweetest disposition and is so incredibly beautiful with his colors becoming more vibrant each day. For us, just like potato chips where you can’t have just one….we are getting another Green Aracaris in the spring! Thank you Jerry for such a great bird and we look forward to our next sweetie to arrive.